The epitome of summertime may be sitting at a beach with an ice-cold beer, but the more time we spend under the sun, the more we should spend thinking about what we eat as well as drink. "Being outside, we need to be aware of dehydration, skin sensitivities and vitamin and mineral deficiencies that may happen to our bodies during the peak of summer," says Rosanna Lee, a nutrition educator and community health promoter based in Toronto. 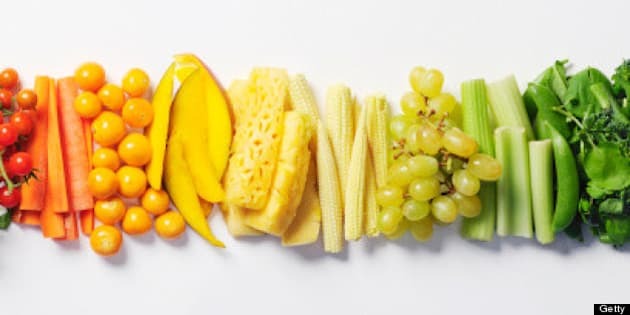 On top of drinking water, fresh juices and smoothies, eating fruit can also help your body stay energized and hydrated. "These summer fruits not only taste great, but they also provide your body with water and a combination of nutrition, keeping your body healthy and happy." Lee says dehydration is a common health risk during hotter months, and for some, it's due to the lack of a proper diet. Particularly children, older adults and endurance athletes are more likely to lose body fluids quicker, according to the Mayo Clinic. It's also important to note that when the air outside is humid, our sweat can't evaporate and cool us down like it normally does, which can make us feel hotter and thirstier. The solution? Eat up. If you're looking for a new way to get hydrated, check out 11 of the healthiest fruits available this season. If you're thirsty, watermelon works wonders in replenishing lost fluids for the body, says Rosanna Lee, a nutrition educator and community health promoter based in Toronto. "Watermelon will keep you cool, hydrated, satiated and healthy. Melons contain lycopene that protects your skin against sun damage, and they're a good source of vitamin A and C."
Not only are these little gems delicious and sweet, but they are also packed with flavonoids that provide antioxidant benefits. "They can also promote increased blood flow to your skin and decrease your sensitivity to light to improve your skin’s appearance, structure and texture," Lee says. When we think of summer, we also think of the tropical vacations and exotic fruits. Pineapples provide a good mix of vitamins, antioxidants and enzymes like bromelain that can protect your body against inflammation. Mangos (fresh or frozen) in yogurt, smoothies, salads, or on their own, add a nice topical kick to your summer fare. These fruits are packed with vitamin A and C, and have cancer-preventing beta-carotene. Did you know green and yellow kiwi are packed with more vitamin C than oranges? "These are definitely a great choice when it comes to one of the summer fruits that offer excellent nutrition. Kiwis are giant berries that are packed with vitamin C and E, potassium, and fibre," Lee says. Some people use papaya juice to tenderize meat or as a natural exfoliating ingredient for healthy and glowing skin. But there are also nutritional benefits to eating papaya on its own. "Papaya contains a healthy dose of vitamin C to help you fight against colds. Vitamins C and E and beta-carotene also help to reduce inflammation within the body." Squeeze! Nothing says summer like the smell of fresh citrus fruits. Oranges are rich in potassium and an essential nutrient and have enough potassium that can prevent against muscle cramps during workouts. On top of this, oranges also contain 80 per cent water so they will also keep you hydrated on the go. Another one on the tropical list, guava is often found in beverages. But this fruit also contains a high concentration of antioxidant properties that can help fight against prostate cancer. "One cup of guava also contains more potassium than a serving of banana," says Lee. Native to South America, passion fruit contains tons of vitamin A and fibre to help improve our vision and lower cholesterol. One serving of this fruit will give you two times more potassium than a banana — who knew? Not only are these fruits juicy and tasty during the summer, but peaches also come with a healthy dose of vitamin C and A. If you're still worried about that beach body, peaches are low in calories and can help you manage your weight. North Americans call this the starfruit, but in Asia it is known as carambola. Starfruits are low in calories and high in vitamin C and a good source of antioxidants. These fruits are usually in season from July through September.